Indium Corporation will feature its precision AuSn solder preforms at International Microwave Symposium (IMS) 2018 from June 10-15 in Philadelphia, Penn. Indium Corporation’s AuSn preforms have the highest tensile strength of any solder, ensuring high-reliability for joining and sealing. The semiconductor-grade AuSn preforms are designed to meet the challenges facing RF and power semiconductor devices as they continue to get smaller, with increasing power density and power ratings. 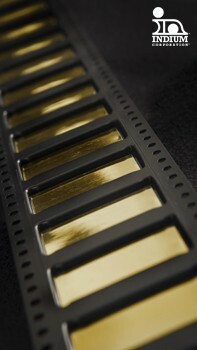 Depending on the alloy, gold-based solders have a melting point ranging from 280-1064°C, making it compatible with subsequent reflow processes. In addition, gold-based solders are resistant to corrosion, provide superior thermal fatigue resistance, and exhibit excellent joint strength. Indium Corporation’s Pb-free and RoHS-compliant AuSn solder preforms are available in a variety of standard and custom-engineered designs. The Gold Preform Quick Turn Program, offers engineering support from design to production, and can result in a quick turnaround for new design, tool, or prototype quantities. For more information about Indium Corporation’s AuSn solder preforms, visit www.indium.com/gold or stop to see us at the show at booth #348.